Step aboard any one of Seabourn’s ships – Seabourn Pride, Seabourn Spirit, Seabourn Legend, Seabourn Odyssey, Seabourn Sojourn or Seabourn Quest – and you’ll enjoy a sophisticated and luxurious journey like no other. You will feel as though you’ve been invited to sail on a private yacht. Three of Seabourn’s ships carry just 208 privileged travelers to some of the most desirable destinations on earth in consummate comfort and sophisticated ease. Seabourn Odyssey, Seabourn Sojourn and Seabourn Quest accommodate 450 guests, with the same personal feel and relaxed ambiance of their sisters, Seabourn Pride, Seabourn Spirit and Seabourn Legend. Your home away from home is a superbly appointed luxury suite. Here, you can revel in sublime comfort as the world passes by. Measuring an ample 277 square feet or more, your Seabourn suite is an ideal haven. The sea is always in view, framed by the expanse of a five-foot picture window or the doors of your balcony or verandah. Fine Egyptian cotton linens, a fluffy duvet and king-sized down and feather pillows encourage the indulgence of afternoon naps. Sunshine enters your suite each day in the form of your personal suite stewardess. Whether she draws the warm, scented bath of your choice from our Pure PamperingSM menu or surprises you at night with a sprinkling of rose petals on your bed, she helps make your wishes come true. Everything you could ever want and more is here. From the complimentary in-suite bar stocked daily with your personal favorites to the flat screen TVs and stereo systems, nothing is overlooked. From the moment you first step aboard Seabourn, you’ll be part of an exclusive circle, the privileged few, who have discovered the true joys of yachting. 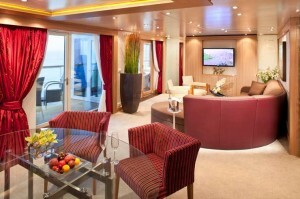 Aboard one of our intimate ships, you will feel like a welcomed guest. The captain and officers seem like old friends. Everyone on the professionally trained staff – more than one per suite – not only knows you by name, but knows your personal preferences as well. The days and nights are carefree and ultra luxurious. Personalized service is a way of life. Never lift a finger while you’re a guest of ours, unless it’s to signal a waiter for another bottle of vintage Bordeaux from the fully stocked wine cellar. Aboard Seabourn, your dreams will come true. Our fervent dedication to exceeding your desires follows you ashore. We shun the ordinary when it comes to experiences in the off-the-beaten path destinations of our ships. Want to take a breathtaking journey by hot air balloon over the soaring rock formations and narrow canyons of Cappadocia, Turkey? We’ll attend to all the details. Planning a romantic evening for two in Paris? We’ll arrange for a horse drawn carriage and fill it with flowers, champagne and hand dipped Belgian chocolates. Call ahead and let us help you plan your special day. The Seabourn Experience is whatever you want it to be and so much more. Some of life’s most cherished moments occur around the table, and every meal with Seabourn is another opportunity to celebrate. Seabourn’s award-winning cuisine starts with the finest quality ingredients, infused with authentic regional flavors, prepared á la minute by our skilled chefs and served with pride. Each Seabourn ship offers a choice of dining venues to suit your mood of the moment, and nearly all are open-seating, inviting you to dine where, when and with whom you wish. Choose the sophisticated fine dining ambiance of The Restaurant. Enjoy a more casual indoor/outdoor venue, or savor the view and a perfectly grilled steak under the stars on deck. Restaurant 2 provides innovative, small-plates tasting menus for a delightful change of pace. Complimentary fine wines are poured with lunch and dinner, and there is never an extra charge for any dining choice. You can even enjoy a meal in your suite or on your veranda, with our compliments. Seabourn is a proud member of Chaîne des Rôtisseurs, one of the world’s most prestigious gastronomic societies devoted to the art of fine dining. 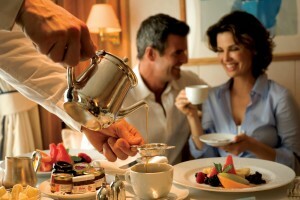 Helping you create the perfect day is something we take to heart at Seabourn. It’s why our lounges and decks are open and inviting, the ambiance relaxed and the variety of activities offered plentiful. Work out in your ship’s well-equipped fitness center, with cardio and resistance equipment. Strengthen your core with complimentary Pilates and yoga classes, or book a private session with a personal trainer. Expand your horizons in our library, at a port lecture or at one of our many inspiring enrichment programs. Enjoy a complimentary Massage MomentSM on deck. Indulge your need for pampering at the spa, or pamper your palate at a food or wine tasting. 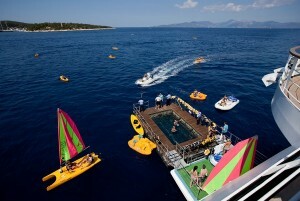 Many voyages feature our signature Caviar in the SurfSM Beach Party or a Marina DaySM, inviting you to enjoy complimentary watersports right from the back of your ship. You’ll find plenty of ways to create the perfect day, over and over again, and all the time to enjoy it. After all, this is your journey, and you can make it anything you want it to be.